The radio programme ‘A World in London’ has been at the heart of the capital’s music scene since 2007. Originally broadcast on the BBC, it is now based at SOAS Radio (University of London) and Resonance FM. Hosted and produced by DJ Ritu , the show has an unrivalled reputation for presenting a rich cultural mix that truly reflects the diverse musical tastes of London and its people. 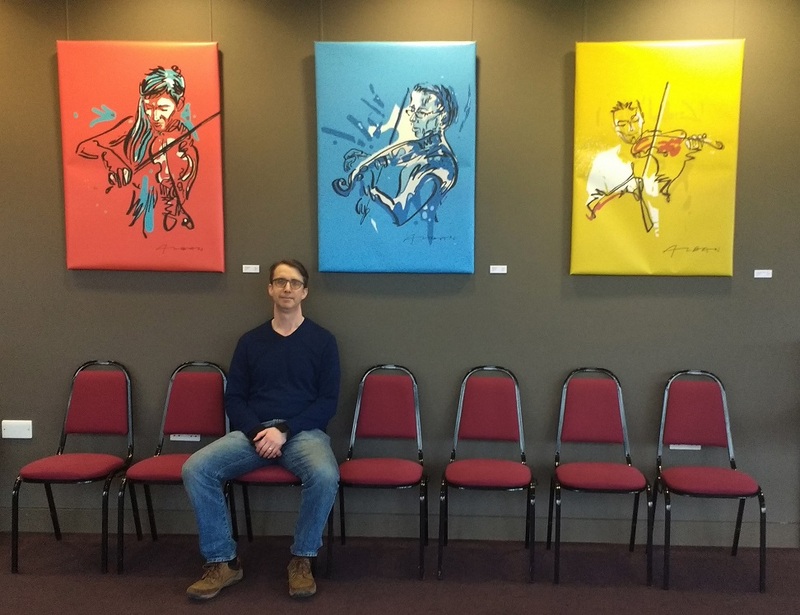 Since 2016, Alban Low has been the show’s artist-in-residence, sketching the musical guests as they play live in the studio. 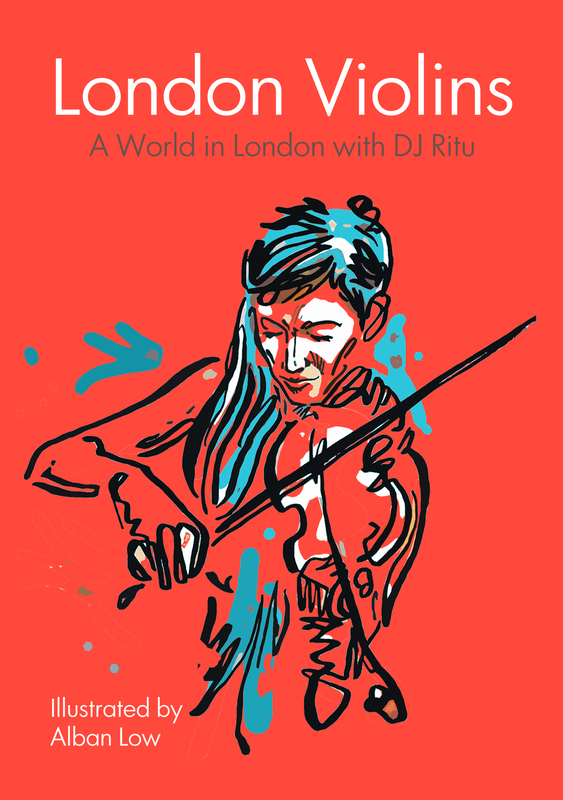 DJ Ritu and Alban Low are publishing a series of books that document the ever-changing live music scene in London. London stirs with musicians from all nations, playing in venues from grand concert halls to vibrant upstairs rooms in pubs. This books aims to capture a moment in a musician’s life and tell the story of their favourite venues. The first chapbook in the A World in London series is London Violins 2018. 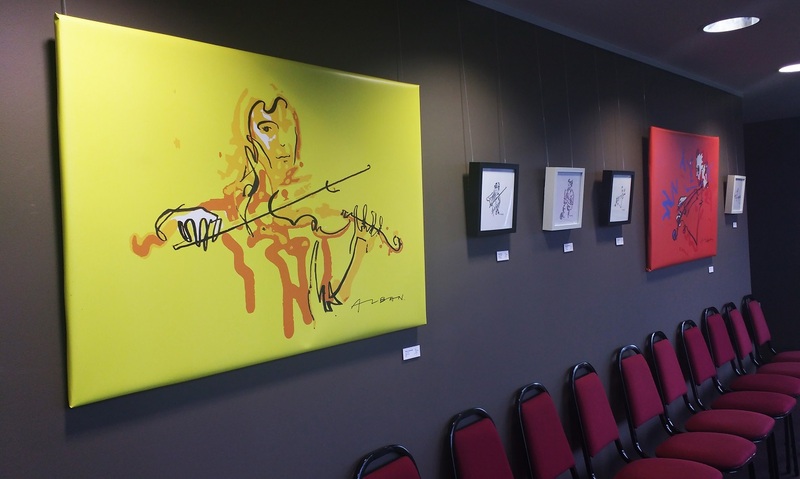 The book’s journey started with an art exhibition at the Yehudi Menuhin Concert Hall (February – June 2018) and will be officially launched on A World in London radio programme at Resonance FM on the 6th June 2018 (6.30-7.30pm). Musicians featured in the chapbook include James Patrick Gavin and Tad Sargent, Alice Barron and George Sleightholme, Olga Baron and John Macnaughton, Robert Atchison and Olga Dudnik, Agnes Branner and Martin Weightman, Anna Lowenstein and Rey Yusuf, Richard Jones and Christian Miller. DJ Ritu is a pioneering international turntablist & BBC Radio presenter. In the ‘90s she co-founded Outcaste Records, signing Nitin Sawhney and Badmarsh & Shri. Ritu has also broadcast for BBC World Service, Kiss 100 and many others. She manages two London club nights, Kuch Kuch and Club Kali, which are the longest running Bollywood events in the UK. Musicians featured in the chapbook include James Patrick Gavin and Tad Sargent, Alice Barron and George Sleightholme, Olga Baron and John Macnaughton, Robert Atchison and Olga Dudnik, Agnes Branner and Martin Weightman, Anna Lowenstein and Rey Yusuf, Sarah Montague and Andrew Ryser Szymański, Richard Jones and Christian Miller. A special thank you to Sofia Gaetani-Morris, Norman Druker, Patrick Bernard and Sophie Darling for their support.